Whether you’re a serious collector or simply an enthusiast, the Dallas Art Fair is the most exciting weekend in Dallas. Hundreds of galleries from around the world gather to show and sell their best works at Fashion Industry Gallery downtown. Those eager to get a sneak peek attend the preview gala, a chic affair where the Ruinart champagne flows freely and guests are dressed in their most artful attire. While some are there only to socialize, others are on the hunt for their next acquisition. Like Claire Dewar, who was all business at the Fridman Gallerybooth. And rightfully so, as Dasha Shishkin’s pastel and acrylic on Mylar works were some of the most interesting on display. Part of the fair’s appeal is its breadth of art — not only because exhibitors hail from as far away as Tokyo, but also because pieces range from attainable to museum-quality. Forgive the cliché, but there is truly something for everyone, no matter one’s taste or budget. Exhibitors bring their best works, and it’s always a pleasure to see Dallas galleries — including PDNB, Talley Dunn, Valley House, and Conduit — holding their own against their more worldly counterparts. Also fun: when galleries like New York’s Peter Blum bring pieces that appeal to our Texas roots, like Enoc Perez’s oil-on-canvas interpretation of Prada, Marfa. After nine years, the preview gala is still one of the hottest social tickets in town, drawing an enthusiastic and energetic crowd. Spotted sipping champagne and soaking in the atmosphere were Justine Ludwig, Jed Morse, Arthur Peña, Christen and Derek Wilson, Brian Bolke, Lynn and Allan McBee, John Reoch, Anais Assoun, Kim and Shannon Wynne, Megan and Brady Wood, Nancy Koen, Ekaterina Kouznetsova and Michael Dylan, Mary Ann and David Goltl, and Peggy Levinson and David Fuller. Every good gala also has a higher purpose: to raise funds for important institutions. In this case, the Dallas Art Fair preview gala benefits Dallas Museum of Art, Nasher Sculpture Center, and Dallas Contemporary. 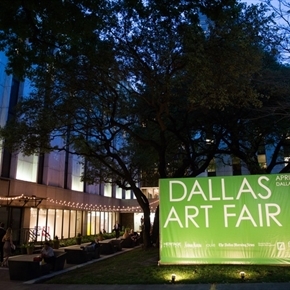 The Dallas Art Fair runs April 7-9. Hours are 11 am-7 pm Friday and Saturday, and noon-6 pm Sunday.